Sorry for the lack of updates. School eats away at energy, time, and creativity. Just a personal note: This Sunday is Heidi’s last at Our Saviour Lutheran. She is moving on to bigger and better things over at Christ Lutheran. So that’s pretty exciting. I think this will be a very good experience for her, and that she’ll get to impact a lot more people’s lives like she did mine. Plus, pastor Jeff is a cool guy, and should be fun to work with. I recently acquired a 1.5 Ghz Pentium 4 from the donation pile at work. This is now my second fastest desktop, and so I wanted to do something useful with it. I decided to set it up with the latest version of Ubuntu and use it to power the colaboration efforts of our JAVA development. Ubuntu is really a nice distro, and I can see why it’s becoming so popular. Once you get a feel for where everything is, you can easiliy get it to do what you want, fast. There isn’t a lot of the grunt work that a lot of other UNIX based systems make you do. Anyways, one program I installed on this machine that has been taking a very large chunck of my time recently is a 3d modelling aplication called ‘Blender‘. I was worried about how we were going to get images for our isometric game, so I thought if we could make a 3D model of our units, then we could get all the still images we want. This is probably a bit overkill, but it gives us a lot of flexibility. And with Blender, even though I’m no artist, I’ve found I can make at least decent looking models which we can use. The theme we’ve kind of decided on is one dealing with navel battles, specifically, pirates! So here is a pirate ship. This is actually the 1st one I made . We now have a set of 3 pirate ships which I think we can do something with. And my group members seem to agree. If you have any inkling to do 3D modelling, check out Blender. While it is a bit confusing to learn (the video tutorials really helped me) once you get the hang of it, it becomes intuitive. And it’s really fun. 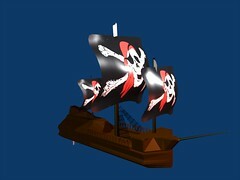 If any one wants to try their hand at a pirate ship, I’d be more than happy to include it with the rest of the group. wink. You are currently browsing the V is for Verbose blog archives for February, 2006.